On Sunday it was reported that Russia has begun delivering advanced S-300 SAM systems to Iran. Iran has been after some of the advanced variants of the S-300P series for some time, and delivery of these systems would represent a significant upgrade to the Iranian air defense network. IRANIAN SAMS, YES OR NO? Iran has been rumored to be a customer or recipient of S-300P variants for some time. Last year it was reported by Jane's that Iran had received S-300PT (SA-10A GRUMBLE) SAM systems from Belarus and was preparing them for service. These reports have yet to be confirmed or conclusively debunked, but Iranian persistance in attempting to order more advanced S-300PM (SA-20 GARGOYLE) variants from Russia does cast a degree of doubt on their accuracy. Russia was quick to respond to Iran's allegation that the S-300's were being delivered. In October Israeli Prime Minister Olmert had met with Russian leaders in Moscow and was assured that Russia would not deliver advanced S-300P series SAM systems to Iran. Shortly after Iran made its announcement on Sunday, Russian officials denied the reports and stated that they were abiding by the agreement made with PM Olmert regarding the transfer of advanced air defense weapons to Iran. If Russia is to be believed in this case, then it would seem that the Iranian government is attempting to force Russia's hand into abiding by whatever sale agreement may have been discussed in the past. Alternatively, this could be an effort to raise eyebrows on the international stage over Israel's interference in Iranian affairs. The other side of the coin is that Russia may be acting deceptively, intending on selling the system to Iran, aiding in its setup, and only announcing the sale once the system has been delivered and emplaced. 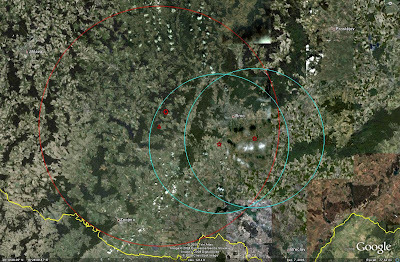 This is not as likely however as the emplacement and activation of these systems would be visible through intelligence sources. The reason for Israeli opposition to a Russian sale of S-300P series SAM systems, particularly late-model S-300PMU-1 or S-300PMU-2 variants, to Iran is clear. Israel is currently preparing for a potential military strike on Iran to thwart Iranian nuclear ambitions. Regardless of whether or not Iran's nuclear intentions are truly peaceful or not, Israel's position regarding the S-300P sale or transfer is understandable. The latest S-300P variants represent some of the most advanced and capable SAM systems in the world, and would represent a significant obstacle to any Israeli air campaign against Iran. One can debate the issue of Israel objecting to a sovereign nation procuring a defensive weapon system, but the fact remains that an S-300P brigade inside of Iran would cause air planners serious problems and potentially prevent them from acting out the wishes of their leadership. The interesting facet of this entire scenario is that Israel has claimed to have developed electronic warfare systems capable of defeating the S-300P series. Israel reportedly obtained the 5N63 (FLAP LID) guidance radar of an S-300PMU (SA-10B GRUMBLE) battery sold to Croatia in 1995. Israeli claims of being able to defeat the S-300P were widely publicised in Jane's Defense Weekly and other media outlets. Israel also exercised with Greece in May and June of this year to gain further expertise against the more modern S-300PMU-1 system and its 30N6 (TOMB STONE) guidance radar. It would appear that Iran has not yet received any S-300P series SAM components. Russian officials would likely not make such a strong assertion were the opposite to be true, knowing that the tell-tale emissions from the system's radar systems would belie their presence to the world once activated inside of Iran. This would certainly eventually be true for two reasons: first, Iran would have to activate the systems in order to employ them in defense of key facilities or border regions, and second, the radar systems used by the S-300P series are not employed by any other SAM system, with the exception of the 36D6 (TIN SHIELD) EW radar. The presence of the guidance and battle management radars inside of Iran cannot therefor be attributed to the sale of any other SAM system. Russia also cannot claim that an advanced S-300PM series system has been supplied by an outside user, as systems missing from China and Greece, being the only other users of the advanced versions, would be missed by American intelligence sources and such an allegation could be easily disproven. The ultimate takeaway from Israel's negotiating with Moscow in October and its August 2008 claim that if such a system was delivered to Iran that Israel would be forced to develop a counter, is that Israel's efforts to defeat the S-300P series of SAM systems may not have been as succesful as once believed. Had Israeli efforts in exploiting Croatian and Greek systems been successful in developing adequate electronic warfare systems and countertactics, Israel would likely have sat by and watched the Iranian regime spend hundreds of millions of dollars on a missile system that they knew represented a limited threat. Given Israel's work in the field of electronic warfare it is possible that reports suggesting that the S-300P could be countered by new systems were a form of deception aimed at convincing Iranian leadership that the purchase of such a ssytem was a wasted effort. In that light, the potential for an eventual S-300P SAM sale to Iran may be the catalyst that finally pushes Israel into striking Iranian nuclear facilities. The Israeli military is rightfully very concerned over the potential of advanced S-300P series SAM systems taking up residence inside of Iran, and if political pressure on Moscow is not enough to prevent a transfer than military action may be the end result. One of the few aircraft to capture the attention of serious aviation buffs, casual fans, historians, and everyone else who has held it in their vision if only for a second is the Lockheed Blackbird, alternatively known to its pilots as the Sled. Born out of a requirement for a faster, higher-flying, more survivable replacement for the CIA's U-2, the Blackbird has become an aviation legend. 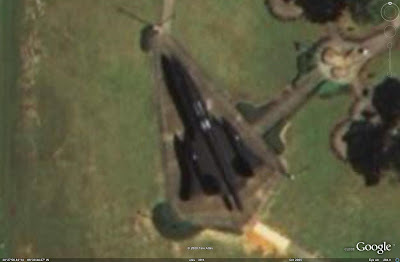 In the spirit of the holidays, this article will detail the locations of Blackbird survivors and depict the locations of those visible in Google Earth. 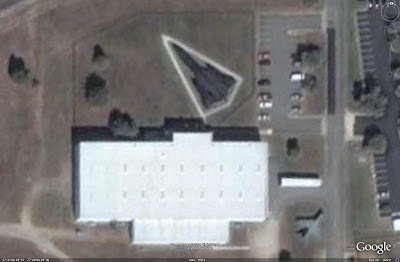 It's Sledding, Google Earth style! The Blackbird, also known as the Sled, the Habu, the Beast, and the Titanium Goose in its various incarnations, was created to fulfill a CIA requirement for a successor to the U-2. As the U-2 flew deep into the USSR on intelligence gathering sorties, advances in Soviet air defenses were threatening to make the CIA's original high flyer obsolete. Something more survivable was needed, and the result was the Lockheed A-12, designed for high speed and high altitude overflight of denied teritory. As it would turn out, the shootdown of Francis Gary Powers on the first day of May, 1960, ended manned overflight of the USSR. Seemingly an aircraft without a mission, the A-12 evolved into one of the mainstays of USAF Cold War intelligence gathering, the SR-71A, and had a productive intelligence gathering career in its own right. 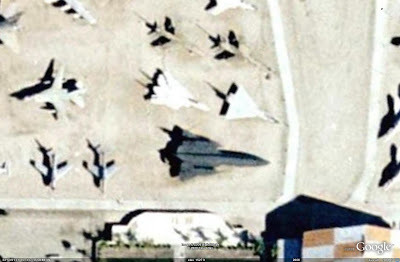 Out of 13 A-12s built for the CIA, only 8 remain. Two of these airframes, Articles 128 and 132, are currently on display indoors at the Central Intelligence Agency and Battleship Memorial Park in Mobile, Alabama, respectively. The rest of the surviving OXCARTs are on display outdoors and can be seen clearly in Google Earth imagery. The second A-12, also employed as a flight test airframe and the A-12 used for pole tests of the aircraft's radar cross section, is now on display at the USS Intrepid Sea, Air, and Space museum in New York City. 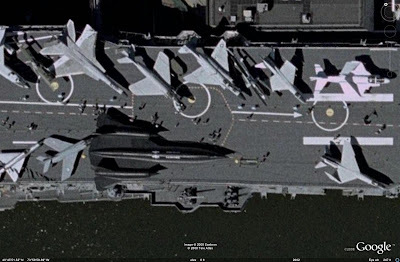 This is the only Blackbird to be displayed on a carrier deck, and doubled as a tee box for Will Smith in the movie I Am Legend. 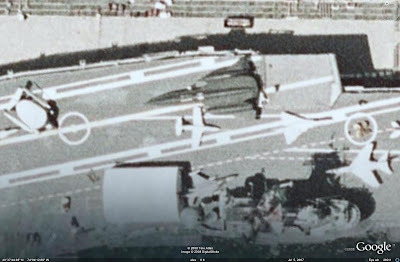 An image of the USS Intrepid in 2002 can be seen below, followed by an image from 2007 while the carrier was docked at Staten Island undergoing refitting and refurbishment. 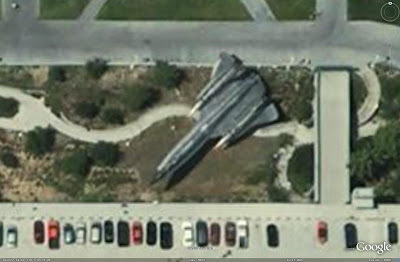 Article 124, the fourth A-12 airframe and the only two-seat trainer, is on display at the California Science Center in Los Angeles. This aircraft, designated AT-12, was nicknamed Titanium Goose and never received the overall black paint scheme found on most other A-12s later in their flying careers. Article 127 is on display at the Marshall Space Flight Center in Hutsville, Alabama. This aircraft is one of three OXCARTs to perform operational reconnaissance sorties out of Kadena AB, Japan. Amusingly, at one point Article 127 featured the characteristic yellow NASA fin stripe on its vertical tail surfaces. 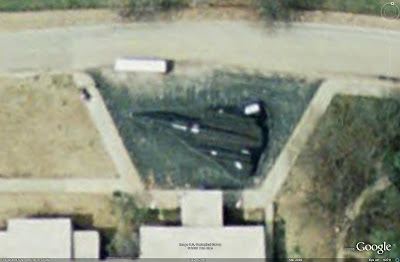 Suffice it to say that NASA never operated an A-12, the existance of which remained classified into the 1980's! Article 128 was previously displayed at the Minnesota ANG Museum in Minneapolis before being removed for display at the CIA. 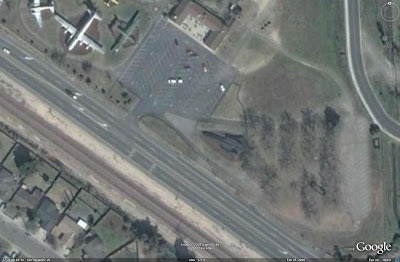 An image of the aircraft on display outdoors in Minnesota is provided below. Article 130 is on display in San Diego at the San Diego Aerospace Museum. Article 131, the other surviving A-12 to have performed operational reconnaissance sorties (06932, the third aircraft, was lost during a training flight), is currently on display at the Birmingham Museum of Flight in Birmingham, Alabama. With three A-12s on display, Alabama currently possesses more than a third of the surviving OXCART fleet! While the A-12 program was progressing, Lockheed realized that the airframe might be suitable for tasks other than reconnaissance. Project KEDLOCK produced an interceptor variant for the USAF, with three prototypes being constructed. The YF-12A prototypes were arguably the most advanced interceptors of their era, featuring long-range pulse-doppler AN/ASG-18 radar sets, and carrying three XAIM-47A air to air missiles. Three YF-12As were constructed by modifying three A-12 airframes on the production line. These were aircraft 60-6934, 60-6935, and 60-6936, referred to as Articles 1001, 1002, and 1003 respectively. The first and third prototypes were written off in accidents, leaving Article 1002 as the sole survivor of the type. After a career as a flight test aircraft with NASA following the cancellation of the USAF F-12 program, Article 1002 was retired to the USAF Museum at Wright-Patterson AFB in Dayton, Ohio, where it resides to this day. The aircraft is currently situated in the R&D Hangar at the museum's annex facility. With the cancellation of manned overflights over Soviet territory, Lockheed began developing ideas for continuing a reconnaissance mission over these territories. The result was the M-21, a two-seat version of the A-12 specially configured to carry and launch a D-21 drone mounted above the rear fuselage. Despite being able to claim status as the world's fastest biplane, the M-21/D-21 combination ultimately proved to be unsuccessful, with the D-21 being modified for launch from two specially outfitted B-52H carriers under the SENIOR BOWL program. The two A-12s modified into M-21 standard were Articles 134 and 135. 06941 was lost during the fourth launch attempt of a D-21 drone, an accident which can be seen here. This video is very interesting from a historical standpoint. Apart from depicting a Mach 3 collision between two formerly classified intelligence gathering platforms, the video tears down one of the assumptions made about the D-21. 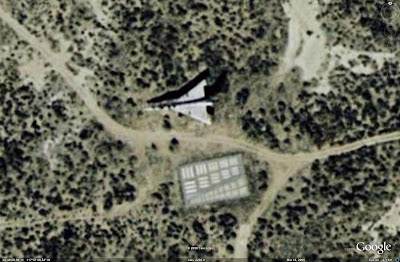 It had been believed due to photographic evidence available that the leading edge probes seen on operational D-21Bs carried by the B-52H launch platforms had been added as part of the D-21B program. 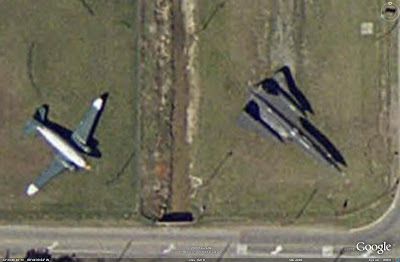 This can be seen to be completely untrue, as the D-21 launched from the back of 06941 possesses these same leading edge probes. The surviving M-21 resides indoors at the Seattle Museum of Flight, complete with a mounted D-21. The SR-71A evolved out of the CIA's A-12 to provide the USAF with a twin-seat strategic reconnaissance aircraft capable of carrying multiple sensor fits to gather complex photographic and electronic intelligence. Operational SR-71As were based at Beale AFB in California. 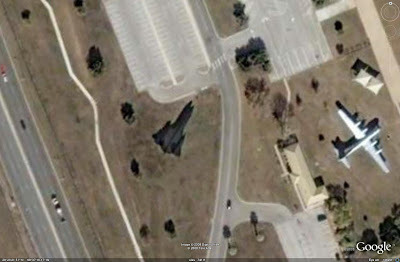 Not only did the SR-71A replace the CIA's A-12 at the Kadena AB operating location, but it served at RAF Mildenhall in England, gathering intelligence on Soviet and Warsaw Pact activity in Europe. Mildenhall-based Blackbirds also conducted reconnaissance over Libya in support of Operation ELDORADO CANYON, to cite a specific example of non-Communist directed operations. Article 2010 was used between 1975 and 1976 to test the Big Tail modification, featuring an extended tail assembly housing various sensor fits. 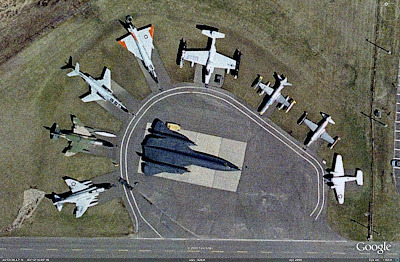 The aircraft was retired from service following the Big Tail test program and can currently be seen on display at the USAF Armament Museum at Eglin AFB, Florida, complete with Big Tail assembly. 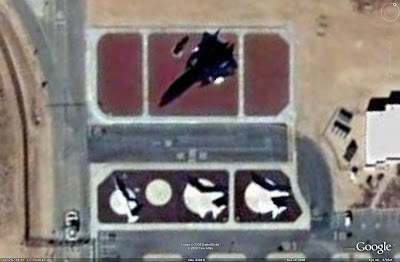 An image of the aircraft on display is provided below. Note that the extended tail fitting can clearly be seen. Article 2011 is on display at the Castle Air Museum at Castle AFB, California. 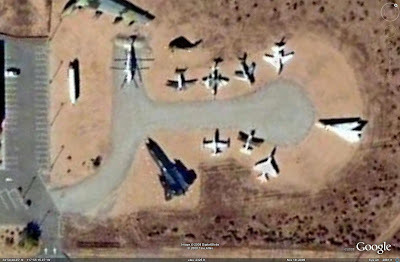 Article 2014 is on display at Beale AFB, California, in company with a D-21 drone. The aircraft is mounted on a replica of one of the patches worn by SR-71 crewmembers. Article 2019 is on display at the Virginia Aviation Museum, Richmond, Virginia. 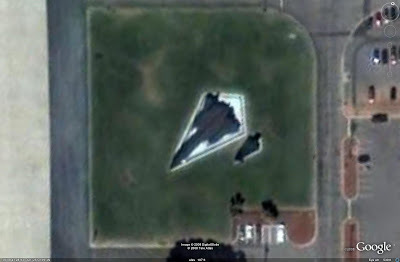 Article 2024 can be seen on display at Blackbird Airpark as mentioned previously. Article 2026 is on display at the March Field Air Museum, March AFB, California. Article 2030 is on display at Heritage Field, Lackland AFB, Texas. Article 2031 is on display at the NASA Dryden Flight Research Center, Edwards AFB, California. I hope everyone has enjoyed this "holiday-themed" aviation topic. 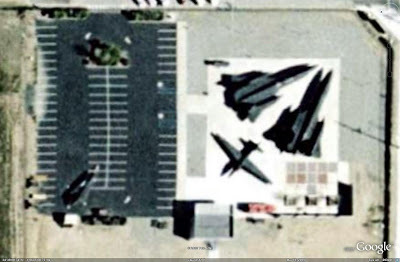 The Blackbird is one of the most interesting aircraft to ever exist, and more information on CIA A-12 operations is declassified each year, ensuring that the complete story has yet to be written. In the meantime, take note of the locations of these high performance aircraft, and take the time to go see one close to you if possible. You won't be disappointed! A placemark file containing the locations of Blackbirds both indoors and outdoors can be downloaded here. 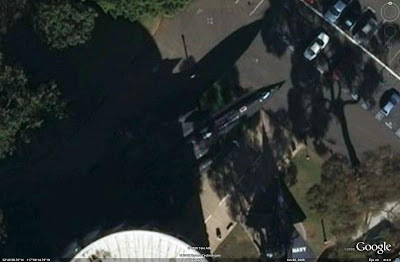 This placemark also containst the locations of Snoopy and various D-21s visible at various locations not mentioned in this article. Lockheed's SR-71 'Blackbird' Family, James Goodall and Jay Miller, Aerofax, 2002. The Avenue To Peace Runs Through...Piracy? Right, I know I don't go off into the political side of things that often, but bear with me on this one. Russia. The Ukraine. China. America. Iran. What do all of these nations have in common? The answer: as of today, all of them have dispatched warships to combat piracy off the coast of Somalia. Some to interdict pirates, some merely to protect their own interests. The interesting issue in all of this is that most of these nations are not exceptionally fond of each other. Russia and the Ukraine are having problems. America and Iran have not had a friendly relationship since 1979. And China? The US political machine wants everyone to believe that they are the new Red Menace. Makes for good military sales figures, but not much else from a logical standpoint. But I digress. Normally, when potentially belligerent nations are operating military hardware in close proximity to one another, bad things can happen. There is the potential for misidentification of intentions and an outbreak of hostilities. Which, plainly, is not really good for anyone. That's why the issue of piracy off the coast of Somalia represents a very interesting political avenue that should be exploited by the US government. This is an opportunity to reach out to all parties involved and establish a joint working group for combating the piracy issue. This may in turn help to break down some barriers in dealing with nations like Iran or Russia. A common goal can often be a good stepping stone to further cooperation and potentially improved relations down the line. Sending a few warships into the Indian Ocean to eradicate pirate vessels is not going to result in the establishment of an American embassy in Tehran or the elimination of Russian opposition to all things NATO or missile defense. But in the long term establishing a good working relationship in this issue with the nations involved could at the very least break the ice and open doors previously locked should the need arise for further military or diplomatic dealings in the future. And if taking out a few pirate ships attacking Iranian cargo vessels or harassing Russian freighters means we are on the road to better relations with those nations, it would be in the best interests of the US government to open its arms to those nations in the spirit of joint cooperation. Besides, five nations working together to obliterate pirate boats and shore positions would surely be far more effective than each nation plowing across the sea lanes looking for trouble on their own. Below is a link to a video, showing a presentation given by Dr. Frank Pabian at the Monterey Institute of International Studies. The concept behind Dr. Pabian's presentation was to depict the effect of open source imagery as an analysis tool in nonproliferation and the response of potentially hostile nations in the form of improved denial and deception. Dr. Pabian uses the ongoing nuclear issue with Iran to illustrate this issue, also briefly touching on the Syrian reactor complex struck by Israel, showing a number of commercial images from sources such as Digital Globe and Google Earth to depict various nuclear-related facilities and the efforts that Iran and Syria have gone to in order to hide the activities at a number of these locations. Great concept, and great presentation, but where this really scores is in the amount of historical and background data taken from various sources to spell out the scope of Iran's covert nuclear program. The video runs about an hour, but it's well worth a watch and is highly recommended for anyone interested in the nuclear issue, nuclear proliferation, and the Iranian nuclear program. THE USS ARIZONA MEMORIAL The image above depicts the USS Arizona memorial. 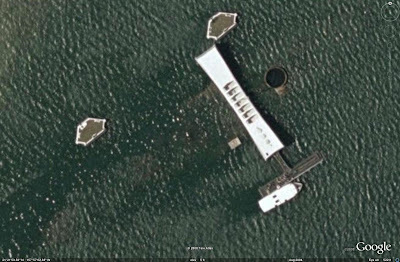 The museum sits atop the resting place of the USS Arizona underneath the still waters of Pearl Harbor, and is a somber reminder of the events that transpired in December 1941 that led to America's official entry into World War II. Inside the memorial visitors can look into the waters and see the remains of the battleship as it rests on the bottom of the harbor. It's a moving experience, and one that every serious military historian should experience in person. 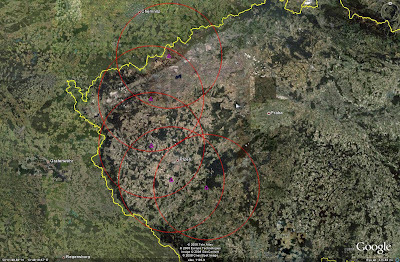 The Hungarian strategic SAM network provided an important piece of the Warsaw Pact's air defense picture during the Cold War. Modernization efforts in the early 1980s expanded the coverage of the network ensuring the defense of both the capital and the most significant industrial area in the nation. 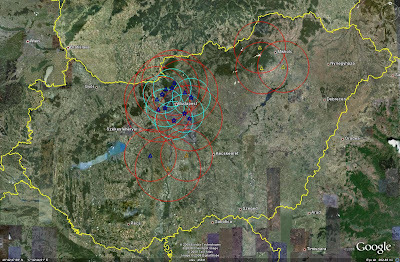 As a regionally structured air defense organization, the Hungarian strategic SAM network provides an interesting study of air defense deployment during the Cold War. 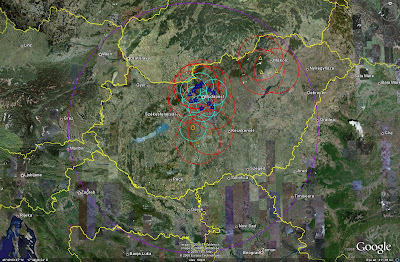 In the imagery contained within this article, SAM systems will be identified as follows: SA-75 and S-75 series sites are marked with triangles and red range rings, S-125 series sites are marked with stars and light blue range rings, and S-200 series sites are marked with hexagons and purple range rings. The deployment of strategic SAM assets in Hungary began in 1959 with the introduction of the first SA-75 Dvina SAM batteries. 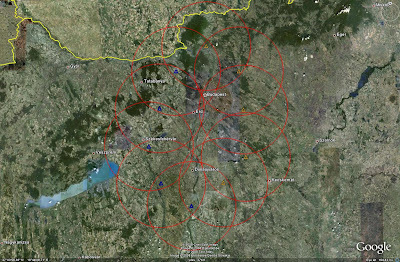 Between 1959 and 1983, the Dvina system provided the bulk of Hungarian strategic air defense, with a maximum of 14 sites being operational through 1976. The Dvina batteries were subordinate to three PLRPs, the 11th, 104th, and 105th. The Hungarian capital of Budapest was initially defended by SA-75 Dvina batteries of the 11th and 104th PLRPs. 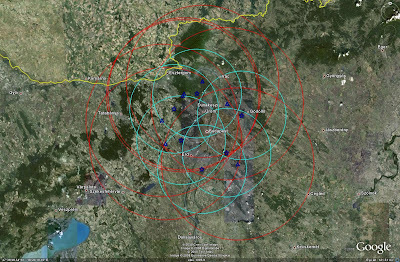 Each PLRP controlled five Dvina sites. The 11th PLRP's Dvina sites were organized along the western side of the capital, with the 104th PLRP's sites being located along the eastern side. 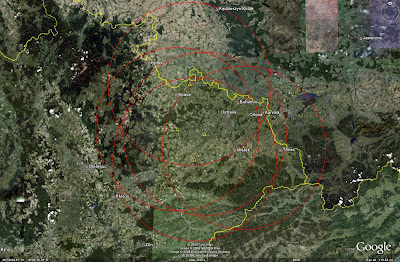 Taken in total, the 11th and 104th PLRP's sites formed an ellipse, with Budapest being situated as the northern focus. The following image depicts the Dvina site locations and engagement zones around Budapest. 11th PLRP sites are blue, 104th PLRP sites are orange. The 105th PLRP controlled four SA-75 Dvina sites situated around Miskolc. Miskolc is Hungary's second largest city and has been the nation's center of industry since the end of the Second World War. 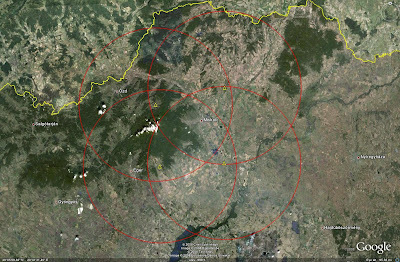 It is therefore logical that a third PLRP would be tasked to provide strategic air defense of the area. Between 1977 and 1986 the Hungarian strategic SAM network underwent a significant modernization. The SA-75 Dvina was replaced with the longer-range S-75M Volkhov from 1977 to 1983. 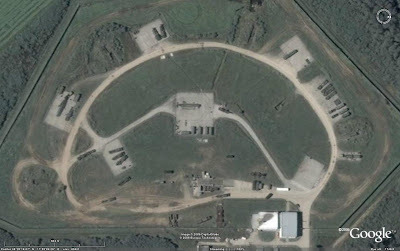 6 Dvina sites were retained and re-equipped with the new system, while 7 new sites were constructed to house the remainder of the Volkhov batteries. By 1983 the Dvina had been completely phased out in Hungarian service, and the Volkhov system would serve until 1995. 1978 saw the introduction of the S-125M Neva SAM system, which would take residence at seven locations, serving until 1995. In 1986 the S-200VE Vega long-range SAM system was introduced at a single location. The Vega would outlast its shorter-range counterparts, serving until 1997. All of these new systems were subordinate to the same regiments that had operated the Dvina system under the old air defense architecture, the 11th, 104th, and 105th PLRPs. 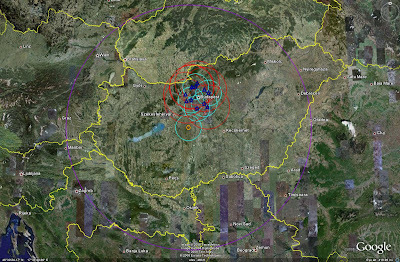 The 11th PLRP assumed responsibility for defense of the Hungarian capital under the reorganized air defense network. The 11th PLRP saw the number of batteries under its control swell under the reorganization, with seven Volkhov and six Neva sites being subordinate to the regiment. All batteries were operational until 1995 with the exception of a single Neva battery located near Piliscsaba, which left the inventory in 1994. 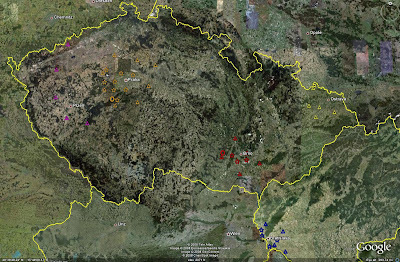 Following the reorganization, the area of responsibility for the 104th PLRP moved southwest of Budapest to the area surrounding the city of Dunaujvaros. 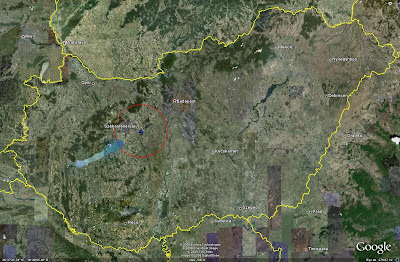 By 1986 the 104th PLRP contained three Volkhov batteries and Hungary's sole Vega site. The 104th PLRP's Volkhov batteries were among the first to be deactivated, leaving the inventory in 1990, at which time a Neva battery was emplaced on the grounds of the Vega site to provide close-in air defense for the system. 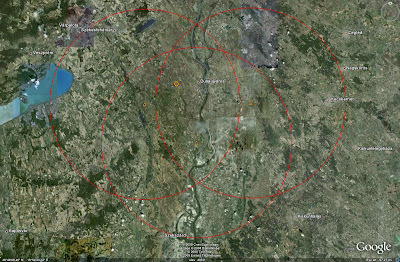 The following image depicts the sites and engagement zones of batteries subordinate to the 104th PLRP after the reorganization, circa 1986. The engagement zone for the Vega is omitted in this graphic. The 105th PLRP survived the reorganization largely unscathed. 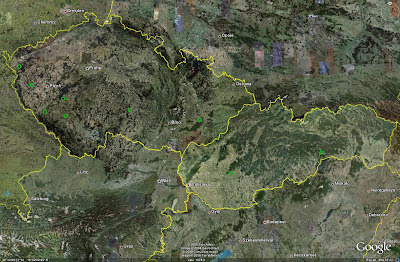 The area of responsibility remained the same, the territory surrounding Miskolc, and only the northeastern site did not receive the Volkhov as it had been deactivated in 1965. The remaining three locations were reequipped with the S-75M in 1983 and served until 1990. Soviet forces stationed in Hungary during the Cold War included eight air defense units manning S-125M Neva batteries. These Neva batteries were located at airfields around the nation to provide air defense for deployed Soviet Air Force units. 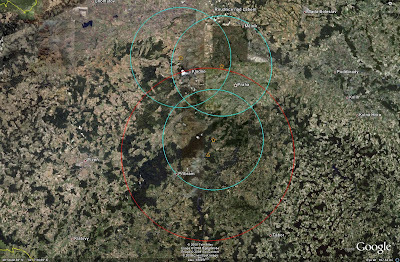 One advantage to having the Soviet Neva batteries in-country was that they were often situated in areas not covered by any other air defense assets. 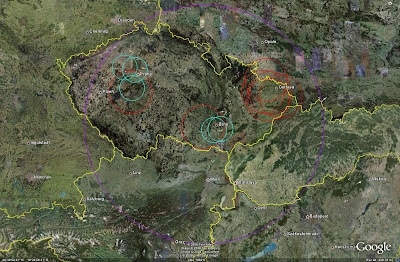 Given the extreme fluidity of the Hungarian strategic SAM network, the overall coverage should be examined chronologically. The following images will depict the SAM network for a given point in time. Each image will be preceded by a brief line of text denoting the time period depicted and the number and type of systems operational for that time period. Soviet S-125M Neva batteries will not be included as there is no historical documentation of their deployment dates. The primary limitation of the Hungarian strategic SAM network during the Cold War was one of coverage. Portions of the central and northeastern parts of the nation were typically well covered by Dvina, Volkhov, and Neva batteries, but no attention was paid to the remainder of the nation. In particular, the western border with Austria was ignored. 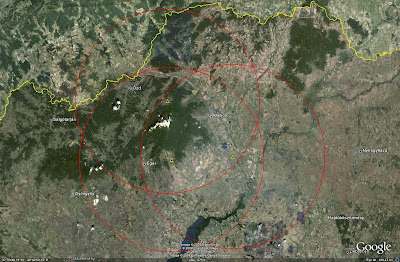 The southern border was less significant as Yugoslavian air defense units would have been initially responsible for targets ingressing from that direction during a conflict with NATO. Yugoslavia was not a Warsaw Pact member state but would likely have not been allied with NATO during a conflict, providing a degree of security. Hungary's position in Central Europe also likely aided its security as NATO's primary focus would have been Soviet Army units located in East Germany and support facilities located in Poland. Hungary was a significant location of Soviet tactical air power during the Cold War, but fortunately for the Hungarians the majority of the fighting would likely have been elsewhere. It should be noted that unlike East Germany and Czechoslovakia, Hungary relied upon older strategic SAM systems. The S-300PMU, supplied to both of the aforementioned nations, was not delivered to Hungary. As a result, Hungarian strategic SAM units were limited by the characteristics of their weapon systems. Each strategic SAM battery of the Dvina, Volkhov, and Neva variety was only capable of engaging a single target at a time due to the command guidance methods employed. 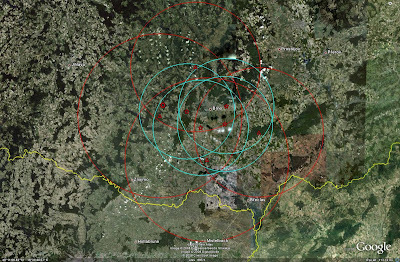 Only the single Vega battery enjoyed something of a multiple target capability, thanks to the presence of two firing positions, each controlled by a separate engagement radar. Even with this added capability introduced with the Vega in 1986, the Hungarian strategic SAM network was still vulnerable to saturation with very little effort. 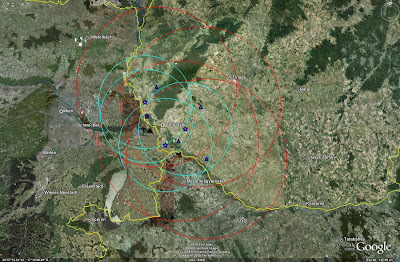 From 1986 to 1989 when the network was at its maximum strength with 20 operational SAM sites, the overall network still only provided the ability to engage 21 simultaneous targets. 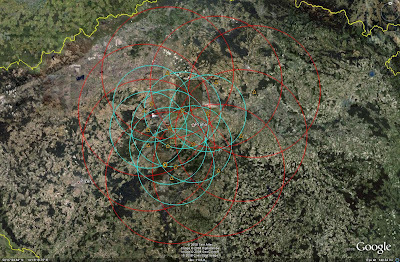 Despite being located away from most of the significant military facilities and units with which the Warsaw Pact would have employed to wage war against NATO, the Hungarian strategic SAM network provided an important piece of Warsaw Pact air defense during the Cold War. While the network was initially relatively pedestrian, modernization efforts would transform the overall network into a much more robust and layered organization. Despite these efforts, however, the strategic SAM network was ultimately incapable of repelling am assed air attack by the air forces of NATO.